TVXQ’s Max Changmin lost his match against the opposing Saipan table tennis team. 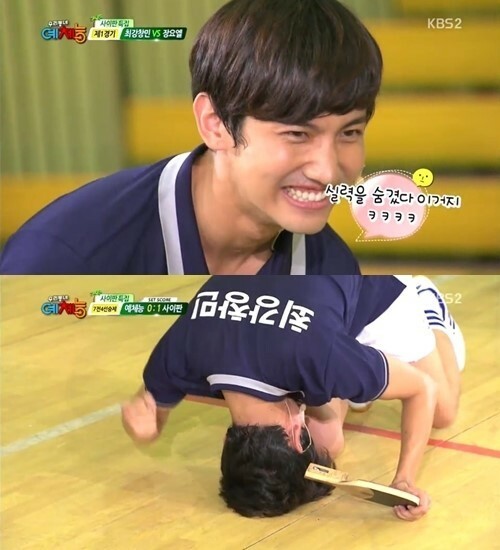 During the episode of KBS 2TV’s ‘Our Neighborhood’s Master of Variety and Sports’ at aired on the 1st, Max Changmin took on Joel Jang in a table tennis match. During their practice round, Max Changmin seemed to be calm and collected as he expected a victory in the main match, but soon gave up points to his opponents as he kept making mistakes at the beginning of the match. Afterwards, his fellow members felt taken aback as Max Changmin refused to accept his mistakes by saying, “My opponent hid his skills.” In the end, Max Changmin was unable to recover and lost to Joel Jang.